English Literature Study Program was established in the academic year of 1962/1963 by Mr. Margono. He later then became Head of the Department, assisted by a secretary, Mr Nyoman Subawa Duarsa. From that moment, in the Department of English’s learning programs was carried out only by him and assisted by another faculty member, Mr Soejono Tedjosoedargo. The three of them are alumni of the University of Gajah Mada. At the end of 1963, Ibu Gedong Bagoes Oka completed BA program at this department, 1976 Mr. I Gusti Made Sutjaja completed his studies in IKIP of Malang, and Mr. Soeparwoto completed his study at the University of Gajahmada. The sixofthem organized in the Department of English learning programs to BA level until 1976. In the same year, English Department opened the program with the S1 with 10 students and 6 graduates in 1981 to produce the first generation that consists of Mr. Joseph Santoso, Mr. I Wayan Jigra Mr. Ida Bagus Putra Yadnya, Mr. I Wayan Resen, Mr. I Nengah Sudipa and Mr. Cokorda Alit Dalem. As time went on and the growing amount of tourists in Bali, the number of students of English Literature continued to grow and as a consequence this program must also increase the number of teaching staff. Until 2014, lecturer in English Literature courses amounted to 46 people consisting of S2 and S3 education degree staff. 1. The mechanics of developing vision, mission, goals and objectives of the study program, as well as the parties involved. The mechanics of developing vision, mission, goals, and objectives of Study Program of English Literature conducted by several stages suchas the first stage is the preparation phase of the draft of vision, mission, goals, and objectives Study Program of English Literature; The second stage is the input filter started from English Literature Study Program staff, the manager of the Faculty of Letters Udayana University, and the stakeholders; and the third stage is the stage of ratification of the document's vision, mission, goals, and objectives Study Program in English Literature. The first stage is the preparation of the draft of vision, mission, goals, and objectives Study Program made by the management of Study Program. Management of Study Program in question is the chairperson of Study Program, Study Program secretary, and the chairperson of the study program in English Literature Study Program. The draft formulation of the vision, mission, goals, and these goals are aligned with the strategic plan of the university and the faculty. The second phase is in the form of networking input from a number of parties that have relevance to the Study Program in English Literature. The first input to the document formulation obtained from the involvement of faculty member in the Study Program of English Literature. Input to the vision, mission, goals, and objectives of the English Literature Study Program. In that meeting, the staff of English Literature Study Program gave opinions, changes, additions, and improvements to the initial document prepared by the manager of Study Program. While the second input was derived from the management of the Faculty of Letters Udayana University. The filter of inputs from the manager of the faculty is an integral part given English Literature Study Program is one of the Study Programs under the Faculty of Letters Udayana University. Therefore, the formulation of vision, mission, goals, and objectives of English Literature Study Program is aligned with the vision, mission, goals, and objectives of the Faculty of Letters, University of Udayana. The third input was derived from the stakeholder. The stakeholders have strong links with English Literature Study Program. 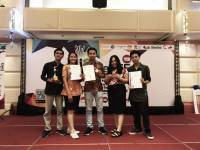 They are the alumni and institutions that have frequently use English Literature Study Program graduates of Udayana University. The third stage is the stage of ratification of the document of vision, mission, goals, and objectives English Literature Study Program. Validation phase was preceded by the final formulation of the document after receiving input from various parties. Official documents of the vision, mission, goals, and objectives of English Literature Study Program was passed through a staff meeting which was followed by English Literature Study Program. Ratification is also marking the use and implementation of the vision, mission, goals, and objectives of English Literature in the next five years. Superior means reliable, quality, and has competence both nationally and internationally in carrying out the activities of Tri Dharma Higher Education and became a center for research, development, and dissemination of knowledge of English language and literature and upholds the moral values of academic to support national development for the realization of a better life. Independent means to have strong human resources, confident, and highly competitive as well as in terms of capability in the development and financing management system autonomously. Cultured means in the development of human resources (HR), institutions, and product Study Program of English Literature upholds the values of academic culture, traditional cultural values, and practices based on the life, which develops academic honesty and truth in order to support the sustainable development for the realization of a better life. Carrying out Tridarma Higher Education (Education and Teaching, Research, and Community Service) qualified in the fields of English language and literature within a period of 5 years. Improve education that encourages the formation of the character of learners who are able to think globally, act locally, and create independence so it can compete in the world of work both at the national and international levels over a period of 5 years. Develop partnerships with both government and private institutions, local, national, and international institutions in terms of improving the capacity, the development of science and technology (science and technology), and an increase in participation in society. Nama Pejabat : Dr. Ni Luh Ketut Mas Indrawati, Dip.TEFL., M.A.